Patients with peritoneal metastases from oesophagogastric cancer have a poor prognosis. We have previously demonstrated an incremental benefit for peritoneal cytology at staging laparoscopy for oesophagogastric cancer. The aim of this study was to determine the value of routinely performing pelvic in addition to subphrenic washings for peritoneal cytology at staging laparoscopy in patients with potentially resectable oesophagogastric adenocarcinoma. Between November 2006 and December 2009, all patients with resectable oesophagogastric adenocarcinoma on spiral CT and EUS underwent staging laparoscopy. Using a standardised technique, subphrenic and pelvic peritoneal lavage fluid were sent for cytological examination. Patients were divided into 5 groups; macroscopic peritoneal metastases (P+), no peritoneal disease and negative cytology (P-C-) or no macroscopic peritoneal disease with positive pelvic cytology (P-PC+), positive subphrenic cytology (P-SC+), or both (P-PSC+). 185 staging laparoscopy procedures were performed. 14 (7.6%) patients were P+, 149 were P-C-, 22 (11.9%) were P-C+, of whom 8 were P-PSC+, 13 were P-SC+ and 1 was P-PC+. Pelvic cytology alone had 40.9% sensitivity for peritoneal disease, and subphrenic cytology alone had 95% sensitivity. 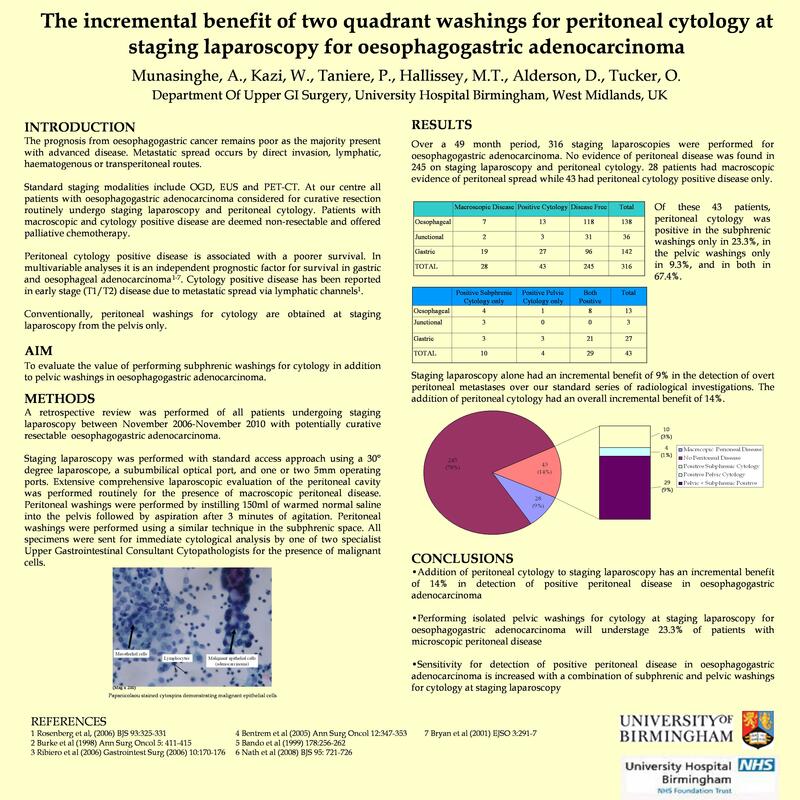 Peritoneal washings for cytology have an incremental benefit for staging oesophagogastric adenocarcinoma in the absence of macroscopic metastatic disease. Subphrenic washings have the highest yield of positive results. However, 4.5 % had cytology that was only positive in the pelvic washings. The routine use of both subphrenic and pelvic washings adds further accuracy to the staging of oesophageal and junctional adenocarcinoma with the avoidance of unnecessary surgery.